I recently wrote about 8 ways you can use Pinterest photos to get parents excited about your upcoming school auction. Here’s another step in how to use Pinterest, the social photo pinboard, with your school auction committee. First, let’s start with some “Pinteresting” facts compiled by comSCORE and reported in various media outlets, like Wall Street Journal. Overall, the demographics show that the social photo pinboard is most popular with females who are also mothers, which is the identical demographic behind the planning of school auctions. Many Moms are snapping photos, finding photos, pinning and sharing. But many do not know that it’s easy to incorporate a video pin into your Pinterest site as well. Add the “Pin it” button to your bookmarks bar in your browser. Instructions on how to do so are at the top of this page. (LINK TO http://pinterest.com/about/goodies/). 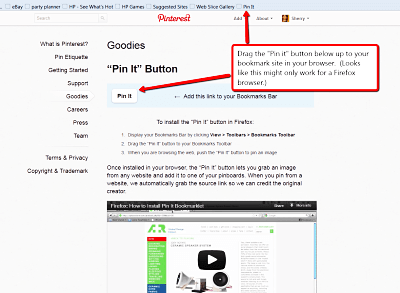 Just drag and drop the “Pin it” button to your bookmarks area. I’ve been experimenting with a number of videos on my Pinterest board showcasing auction centerpieces. You can see what it looks like here. (LINK TO http://pinterest.com/redappleauction/auction-centerpieces/ I’m trying to select shorter videos that I think will be more popular with the Pinterest community. Pinterest photos are fun, but it’s also fun to find or creative appropriate videos. Let me know how it works for you below.